We love them with all our hearts, but do we really know where our dogs came from? Kim Kavin reveals the complex network behind the $11-billion-a-year business of selling dogs. A must-listen for the benefit of all dogs everywhere. In what promises to become an Omnivore's Dilemma for dog lovers-breed devotees and adoption advocates alike-The Dog Merchants is the first book to explain the complex and often surprisingly similar business practices that extend from the American Kennel Club to local shelters, from Westminster champions to dog auctions. Without judging dog lovers of any stripe, The Dog Merchants makes it clear that money spent among these dog merchants has real-world effects on people and canines. 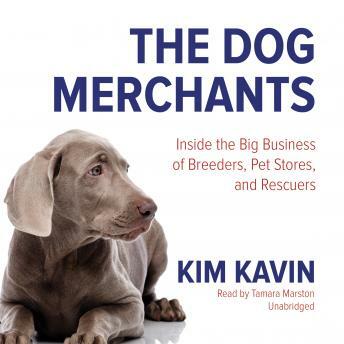 Kavin reveals how dog merchants create markets for dogs, often in defiance of the usual rules of supply and demand. She takes an investigative approach and meets breeders and rescuers at all levels, shedding much-needed light on an industry that most people don't even realize is an industry. Kavin's goal is to advance the conversation about how all dogs are treated, from puppy mills to high-kill shelters. She shows that a great deal can be improved by understanding the business practices behind selling dogs of all kinds. Instead of pitting rescue and purebred people against each other, The Dog Merchants shows how all dog lovers can come together, with one voice as consumers, on behalf of all our beloved companions.